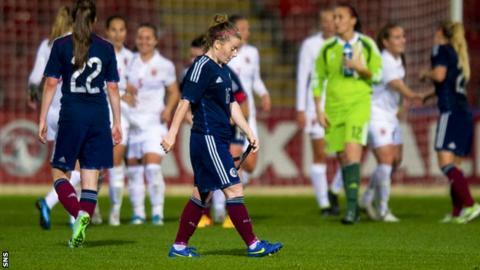 Scotland coach Anna Signeul urged her side to remain positive ahead of their opening Euro 2017 qualifier, despite a 4-0 friendly defeat to Norway. Signeul made a number of changes in order to keep her side fresh for the trip to Slovenia on Tuesday. "The focus is on Slovenia and that's always been the case," said Signeul. "It's important we go there and don't lose any confidence from this, because we are a positive team and a positive squad." The Scots faced former world champions Norway at Firhill as they finalised their preparations for the Euro 2017 qualifiers, which as well as the Slovenians will see them come up against Iceland, Macedonia and Belarus. Emilie Bosshard Haavi put the visitors ahead with a stunning long-range effort before Ada Stolsmo Hegerberg, Nora Holstad Berge and Ingrid Moe Wold added more. "It is a disappointing loss of course, conceding four goals," said Signeul. "I don't think it was a 4-0 game though. "It shows a little bit our weakness, and we can't play Norway without our best players. It's tough. "I think we have some really positive things we can take from this game. I thought Lisa [Evans] was grand, she was fit in the first minute and the 91st minute. "Maybe we shouldn't have played such a strong opponent but there's an opportunity now for other players to step up. I think we were just a little bit unlucky with the goals." The game gave Signeul the opportunity to field a lot of young players, with Hibs' 19-year-old striker Lizzie Arnot coming on in the second half to win her first cap. Team-mate Kirsty Smith also started the game in defence in what Signeul admitted was a steep learning curve for her. "The exercise was about getting experience and the young players learned a lot, and even the more experienced ones," added Signeul. "I thought they did great. For Kirsty it was tough to start in the first half, she learned a lot tonight. "Hibs are doing well with good games against Glasgow City but she experienced a lot tonight. It was a great game for her to learn. "The youngsters that are coming now are very good."